There are a few famous people who have become just as known for their expressive faces as for actual acting performances, including the likes of Steve Harvey and Kate McKinnon. 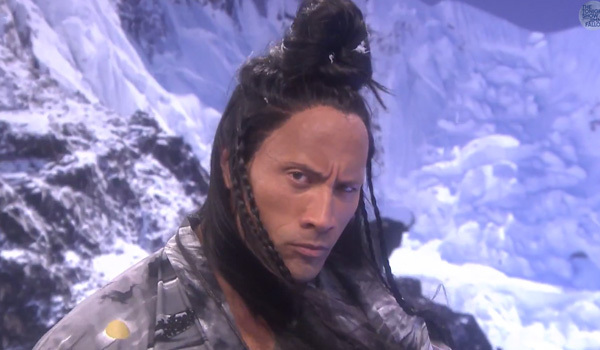 Dwayne “The Rock” Johnson is one of these people, making his recent “Intense Staredown with Jimmy Fallon” all the more enjoyable. Check it out, below. 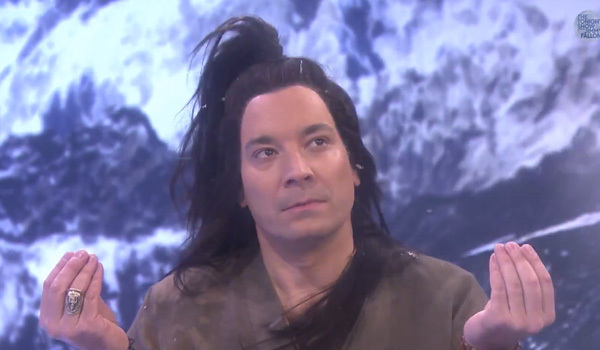 The Rock and Jimmy Fallon don robes and some pretty intense wigs for the sketch, which positions them meditating high up in the snowy mountains. The faux meditational sketch features the two guys making funny faces as they say some really weird stuff, including “Fool me once, shame on you. Fool me twice, shame on me. Fool me thrice…why you gotta be so rude.” Ignore the oddball dialogue, because this sketch is obviously all about the faces, like this signature one from The Rock. It’s almost like The Rock’s entire career, every single ounce of work and sweat that he put into wrestling and acting, has led up to this one epic late night moment. Almost. But that's seriously an eyebrow raise that must have taken time to perfect. Not to be outdone, Jimmy Fallon has an eye trick that’s pretty interesting, even if it doesn’t quite compete with The Rock’s eyebrow trick. The Tonight Show with Jimmy Fallon sketch is a recurring one; formerly, we saw the accomplished late night host get stared down by actor and musician Jared Leto (this is just before Fallon got to cut off his beard). Jimmy Fallon’s typically a man who prefers to play fun games with celebrities, but every once in a while, he’ll go the irreverent route with people like Brad Pitt. The Tonight Show may be less about interviewing now that Fallon has taken over, but in some ways that can be really refreshing, especially for only casual fans. In fact, I bet there are some people who never tune into The Tonight Show and still keep up with it, simply through hilarious viral videos. You can catch NBC’s The Tonight Show on weeknights at 11:30 p.m. ET. And catch more from Dwayne Johnson in the new, excellent San Andreas trailer.